We are deeply concerned about the recent media reports linking some judicial officers to some improper conduct which has in many ways compromised this very important arm of justice. We can not over emphasis the importance of an impartial and independent judiciary. As citizens we depend on the strength of this institution and the Judges for justice. It is therefore imperative that this very critical institution maintains its decorum. We therefore are perturbed about reports that some of the judicial officers involving themselves in questionable conduct. As a pillar and bastion of our justice system, the judiciary should not only be seen to be above reproach especially that it insulates itself from public criticism. We remain mindful also however the the judiciary derives to power from the people and the constitution. The people should therefore have a say as to how their power is exercised . We therefore appeal to President Edgar Lungu to seriously take interest with the happenings in the judiciary. We call upon the President to disband the entire judiciary, especially the Judges and reconstitute it so that it can retain its sanctity. The allegations of corruption about some named Judges has a chilling effect on the justice system of the country. Citizens are fast losing confidence in the judiciary a situation if not addressed has the potential to lead to chaos as citizens will revert to jungle law. It is in the interest of both the Executive, especially President Lungu and the judiciary itself to restore public confidence in this arm of government. Those that have been accused of corruption in the judiciary at any level should be made to account through a tribunal. 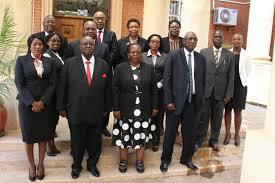 We appeal to President Lungu to also consider constituting a Tribunal for all judicial officers and Judges that have been accused of wrong doing. In Kenya, the Deputy Chief Justice is being investigated for corruption and we as a country can learn for them.